The Royal Netherlands Society of Engineers (KIVI) is organizing a symposium on the opportunities and threats of the energy transition for our industry at The Hague University of Applied Sciences on May 1st, 2018. 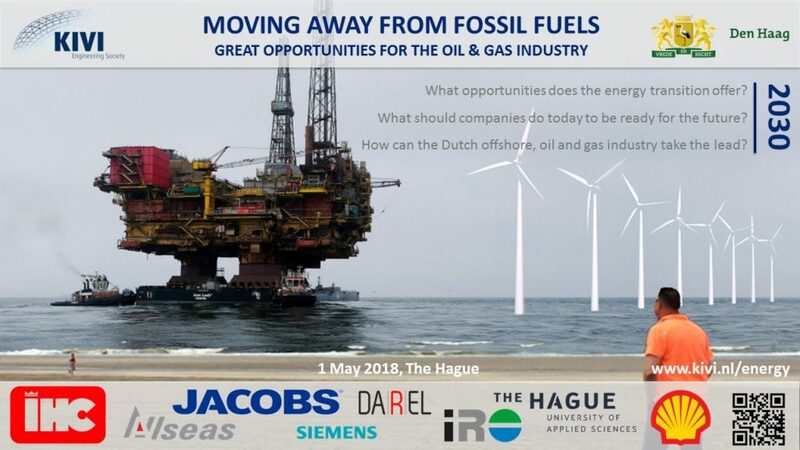 In a world with growing energy demand and with a transition away from fossil fuels towards more sustainable energy sources coming our way, we, the Dutch offshore, oil & gas industry face the challenge to remain leading during and after this energy transition. What does the sector need to do today? What opportunities does the energy transition offer? The goal of the symposium is to actively contribute to the debate around the energy transition, specifically in the Dutch context. Speakers from governmental bodies, NGOs, Oil & Gas companies, suppliers and academia are invited to share their views in presentations, followed by interactive panel discussions and audience questions. Keynote speakers will be Jeroen van der Veer (former CEO Royal Dutch Shell), Ruud Koornstra (first Energiecommissaris for the Netherlands) and Marjan van Loon (President-directeur Shell Nederland). We aim for attendance of persons from industrial parties, government, non-governmental organisations and, last but not least, many students. It is our pleasure to invite you to join us during the day.